Vitamin K1 is a found in dark green leafy vegetables, asparagus, brussels sprouts, some grains, olive oil, prunes, soy bean oil, and canola oil. The body has limited storage capacity for Vitamin K and uses a recycle system to reuse it. Vitamin K1 is a fat-soluble vitamin that after Duodenal Switch is not as easily absorbed due to the limiting contact of the food product with the bile until the common channel. Bile is needed to absorb fatty acids and fat-soluble vitamins. Duodenal Switch patients in need of Vitamin K1 supplements should take “Dry” or water miscible type of Vitamin K1, such as Biotech brand. The patients laboratory studies will determine if a patient requires Vitamin K1 supplement. Duodenal Switch patients should have laboratory studies drawn and evaluated at least on a yearly basis. Vitamin K works in a delicate balance with other supplements and should be monitored by a physician, in at risk people. Vitamin K1 is most know for it’s coagulation effect and the clotting cascade. Vitamin K1 works with calcium and proteins in order to accomplish coagulation synethesis. Care should be taken with Vitamin K supplementation and anti-coagulation (blood thinners) therapy. Please see your physician regarding any supplementation of Vitamin K and blood thinner medications. A discovery of Vitamin K dependent proteins has led to research on Vitamin K1 in bone health. 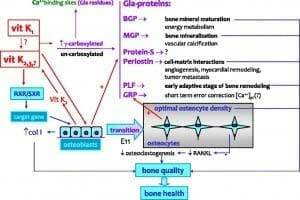 Bone matrix proteins, specifically osteocalcin, undergo gamma carboxylation with calcium much the way coagulation factors do; this process also requires Vitamin K. Osteocalcin is a Gla-protein that is regulated by Vitamin D. The calcium binding ability of osteocalcin requires several Vitamin K carboxylations to exert it’s effects on bone mineralization. As always, discuss with your physicians and/or surgeon any changes in medications and supplements. This is not meant to be an all inclusive discussion of Vitamin K.